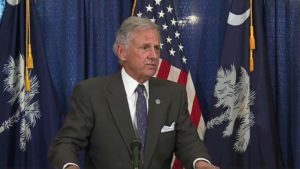 Columbia, S.C. (WOLO)–Governor Henry McMaster is calling on SCANA to give rate-payers a refund in the wake of the abandonment of construction on two nuclear reactors at the VC Summer nuclear facility. In a letter to the company, Governor McMaster writes that the company should immediately cease its collection of approximately $37 million per month. McMaster adds it is unreasonable and oppressive for SCANA to require its customers to bear the burden of actions and decisions in which customers played no part and over which they had no control. SCANA and Santee Cooper’s decision to end construction on the reactors resulted in close to 6,000 layoffs.